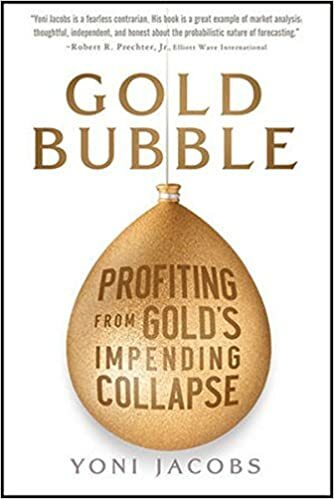 How do TV shows, vending machines, Chinese taxi companies, and a former UK prime minister point to a gold bubble that is about to burst? Many investors consider gold a "safe haven" that will shelter them from recessions, falling markets, and the depreciating value of currency. Many fail to realize, however, that investing in gold at these levels is extremely risky. "We Buy Gold" stores line busy streets, gold miners are no longer protecting themselves from a potential drop in prices, and gold is even being sold in vending machines. All this points to one thing: a gold bubble has formed and will collapse very soon, hurting investors, funds, and banks. In Gold Bubble: Profiting From Gold's Impending Collapse, Yoni Jacobs looks at how you can protect yourself. Presenting an in-depth analysis of gold dating back over a hundred years, the book explores the structural factors that have allowed gold to form a bubble, why an investor psychology of fear and greed is leading to extremely speculative behavior, why gold will fall during an upcoming recession, what effect the dollar and the stock market will have on the future of gold prices, and how to profit from a gold collapse while the majority of investors lose out. With gold prices up over 2,500 percent since 1970, and more than 600 percent since 1999, a bubble has formed and is on the verge of bursting. But until now, no one has been willing to publicly bet against the universal currency. With Gold Bubble you are ready to meet this challenge head on, and take advantage of what other investors won't even acknowledge.